On a clear and sunny day, I followed the buzz of chatter swarming the air on the edge of Manhattan's east coast. My sense of purpose perked slightly as I walked towards a line that was forming in front of the revered United Nations building. I quickly found my colleague, Jocelyne, surrounded by dozens of youth, all of whom were anticipating the event to follow in just minutes. 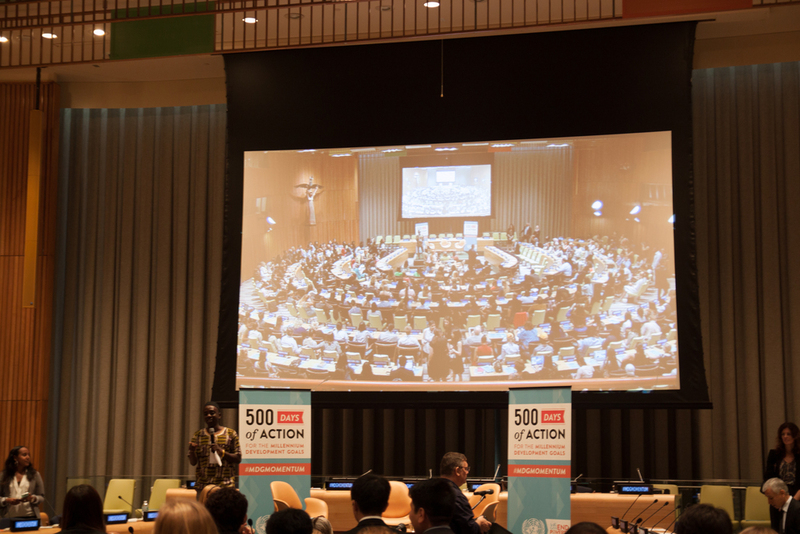 After all, Malala Yousafzai and UN Secretary General Ban Ki-moon were in the house, and well, who wouldn't be stoked? I had never stepped foot into the United Nations, and as an architect and volunteer for the American Pakistan Foundation, I have become incredibly wrapped up in social reform and simply learning more about the politics of culture around me! So what better way than to join my peers in the conversation and spark the inspiration necessary to contribute to society? You see, beyond the parameters of my office cubicle, I feel an urgency to reconnect with the world- to step outside the boundaries of a standard architect, and gain a sense of real world issues. Consequently, as an architect, I can become better equipped to design for others! Why should I have the responsibility to enhance living spaces if I cannot grasp the quality of life? Those next two hours were certainly captivating, as Malala Yousafzai shared her journey of the last year. Malala, who stood upto Taliban’s gunpoint in 2012 in order to demand a school education, narrated her recent ventures to combat global ignorance. 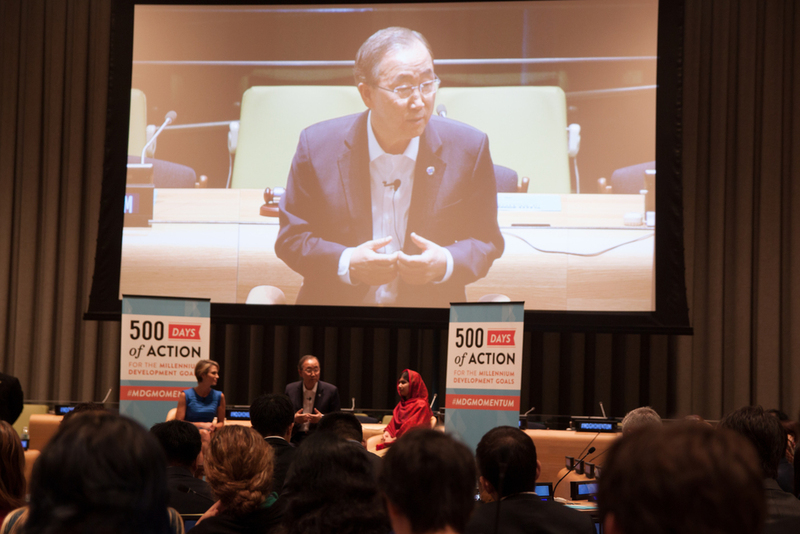 Ban Ki-moon also declared his support for the 500 youth in the room, including Malala. He urged us all to act. Both declared the priority of education as governmental priority! Malala’s zeal for education stems from her personal beliefs- she stated that she did not know she held rights. The simple act of knowing was inherently liberating. Their accounts are part of a larger message- the Millenium Development Goals. This particular event marked the 500 remaining days to conquer this mission. The eight Millenium Development Goals were set forth at a UN summit in 2000 by world leaders, and mark a 15 year venture for education, health, women’s empowerment, environment, poverty, and more. While acting out for the will of others may seem daunting, Ban Ki-moon urged that we should not trivialize our role. In fact, we each play an important role. Even he said, so simply and quickly, “I’m one of you.” Powerful few words, which show that one person’s actions can go a long way. We can each influence a community, a classroom, or a childhood friend. Coming out of the conference, I was incredibly thrilled to see how many of my peers are involved in reform- critical thinking and questioning are key, to awaken the beast of change! I also look back upon my education and realize I can foster my formal training into basic necessities for humanity. I hope one day I will receive the chance to step away from the glamourized world of architecture in New York City and work on projects that will benefit the members of society who need it most. As a side note, I must also add that Ban Ki-moon’s appeal to the environment awakened the ‘green’ in my soul! In fact, he even mentioned the United Nations Climate Change Summit Meeting, which will take place at the United Nations this September. Please join in the conversation if you are interested! Click below to scroll further through gallery.